10 cm tall each (4 inches). 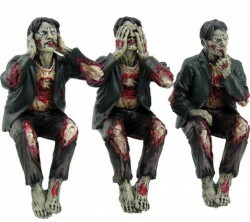 Boxed set of 3 beautifully detailed zombies. Actually they are not that wise being zombies and all. Arrives boxed within polystyrene casing.